SHY gave me a tag. (You can see her post on the screen of my laptop. Haha!) I think it's fun, too. You know.. just for nothing. Haha! And now, I'm passing tags to the bloggers of Pig's Tale, Phronesis, and Crispy Papaya. 1. Take a picture right NOW!!! 2. DON'T change your clothes, DON'T fix your hair... Just take a picture. 4. Post these instruction with your picture. 5. Tag to your friends. 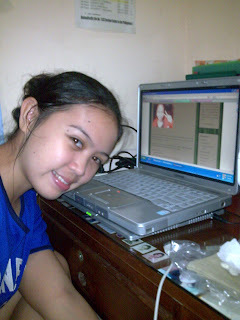 hey your blog is nicely written..
You have a great smile !